ED’s rulemaking should be revaluated based on the lessons learned from GI Bill oversight and the impact on veterans. In each of the areas ED is proposing changes, veterans have been disproportionally harmed in a veritable cycle of scandalsinvolving poor quality, predatory schools chasing GI Bill dollars. 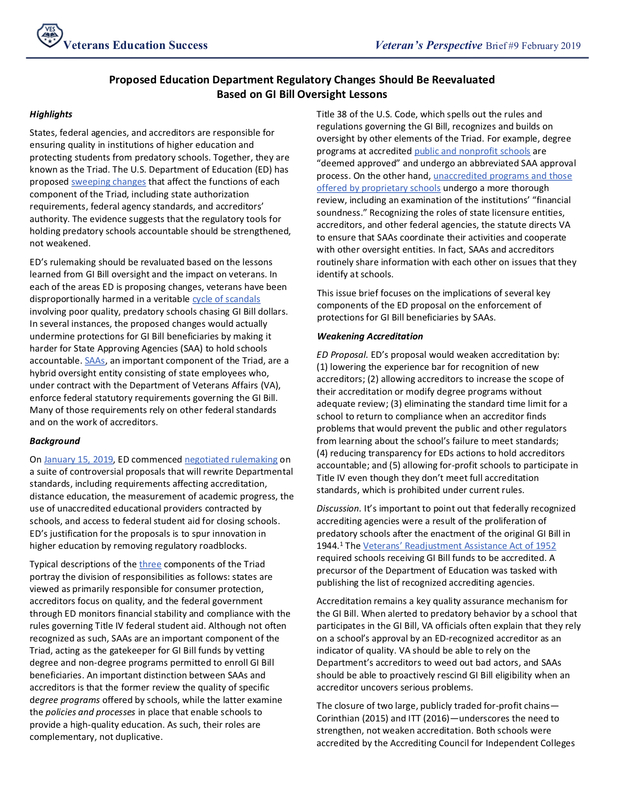 In several instances, the proposed changes would actually undermine protections for GI Bill beneficiaries by making it harder for State Approving Agencies (SAA) to hold schools accountable. SAAs, an important component of the Triad, are a hybrid oversight entity consisting of state employees who, under contract with the Department of Veterans Affairs (VA), enforce federal statutory requirements governing the GI Bill. Many of those requirements rely on other federal standards and on the work of accreditors.